Nina Dobrev Talks About Her New Show ‘Fam’ & Life After ‘Vampire Diaries’! | Nina Dobrev | Just Jared Jr.
Nina Dobrev is opening up about her new show! The 30-year-old Fam star appeared on Build Series on Thursday (February 28) in New York City. 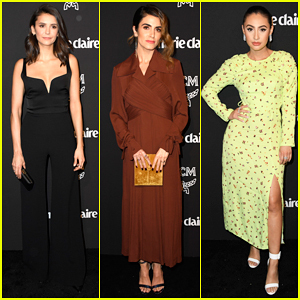 During her appearance, Nina talked about her new CBS comedy Fam, which follows Clem (Dobrev), a woman whose vision of a perfect life with her adoring fiancé and his wonderful family is radically altered when her 16-year-old, out-of-control half-sister unexpectedly comes to live with her. As the family Clem chose and the family she has blend, Clem realizes that this happy fam may be the perfection she’s been seeking. She also opened up about doing comedy, working with Odessa Adlon, Tone Bell and the rest of sitcom cast, as well as life after Vampire Diaries and how she feels about her fans, social media and body image. Watch her full appearance below! Also pictured below: Nina Dobrev heads out on Thursday afternoon (February 28) after her Build Series appearance in New York City.